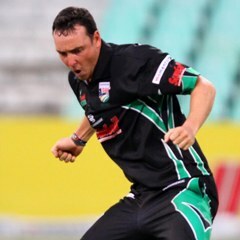 Centurion - Kyle Abbott held his nerve to concede just four runs off the final over, as the Sunfoil Dolphins pipped the Nashua Titans by just two runs in a thrilling Momentum One-Day Cup encounter at Supersport Park in Centurion on Friday. David Wiese (71 off 49 balls) had kept the Nashua Titans interested until the very last ball, as he clubbed ten fours and two massive sixes in a defiant knock. But the Sunfoil Dolphins, aided by a run out in the final over, clung on for a win that kept their hopes for a play-off slot alive. Having been put in to bat by the hosts, the Sunfoil Dolphins did well to amass 264 for eight in a contest reduced to 47 overs a side.The visitors were reduced to 55 for three by the 16th over, as Albie Morkel accounted for both Imraan Kahn (22) and Daryn Smit (6), in conditions that assisted the swing bowlers. Morkel returned fine figures of three for 41 in ten overs. Divan van Wyk weighed in with a steady 54 off 77 balls and the left-hander found an ally in Cody Chetty (74 from 76 balls), who continues to flourish with the bat for the Sunfoil Dolphins. His sometimes unorthodox strokeplay saw him crack eight fours, and transfer the pressure to the Nashua Titans’ bowlers in the middle overs. The duo added 88 for the fourth wicket, paving the way for the lower order to have a crack. Big Robbie Frylinck didn’t disappoint, clubbing two sixes and three fours in a 31-ball 46 not out, while fellow seamer Abbott also wielded the willow to good effect, his 29 - which included five fours – coming off just 18 balls. Their cameos saw 70 runs pummelled off the last seven overs, to give the visitors a handy total to defend. In reply, the Nashua Titans lost Heino Kuhn early, ousted by the accurate Lonwabo Tsotsobe, before the Sunfoil Dolphins’ other left-armer, Mthokozisi Shezi, accounted for Mangaliso Mosehle to reduce the Titans to 38 for two after eight overs. The in-form pair of Henry Davids and Martin van Jaarsveld then added a breezy 46, before the home skipper was caught behind off Abbott for 23. Farhaan Behardien (19) fell to the same combination, before Abbott trapped the dangerous Morkel leg-before for just five to leave the Titans wobbling at 124 for five. But Davids was still there, and he added a significantly more sedate half-century to the 166 he pummelled against the Chevrolet Knights in midweek. Three sixes and three fours kept him ticking along, and it was a surprise when he was bowled by the combative Frylinck for 76. With the danger man gone, the Sunfoil Dolphins must have fancied their chances for a comfortable win. But they hadn’t reckoned with Wiese. Having started cautiously, building his innings with ones and twos, the Tarzan-like all-rounder then went ballistic in the late overs. He was especially brutal on Abbott, heaving him for 21 off the 43rd over, to turn the match on its head. The Sunfoil Dolphins breathed a sigh of relief when he holed out to Van Wyk off the bowling of Frylinck, but Eden Links then smeared a six and a four off Tsotsobe to leave the Nashua Titans requiring 12 off the last two overs. Frylinck, an old hand at death bowling, gave away just five from the penultimate over, leaving Abbott with seven to defend in the final over. That he did, conceding a miserly four runs, to secure a tumultuous, but thrilling win for the visitors. Nashua Titans: Henry Davids, Heino Kuhn (wk), Mangaliso Mosehle, Martin van Jaarsveld, Farhaan Behardien, Albie Morkel, David Wiese, Roelof van der Merwe, Rowan Richards, CJ de Villiers, Eden Links. Sunfoil Dolphins: Imraan Khan, Divan Van Wyk, Daryn Smit, Vaughn Van Jaarsveld, David Miller, Cody Chetty, Robbie Frylinck, Kyle Abbott, Prenelan Subrayen, Lonwabo Tsotsobe, Mthokozisi Shezi.